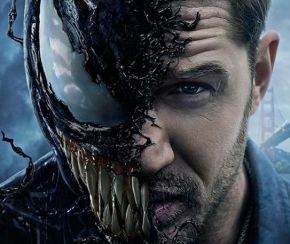 After visiting CinemaCon in Las Vegas, Sony Pictures have officially released the first proper trailer for their upcoming spin-off movie Venom. Venom follows reporter Eddie Brock as he investigates the Life Foundation, but when he is bonded with an alien symbiote he has to control and work with his new monstrous alter-ego. Tom Hardy stars as the titular character, Michelle Williams as Anne Weying, Riz Ahmed as Dr Carlton Drake, and Woody Harrelson as an undisclosed role. Venom has been appearing in comic books since 1988 as an antagonist to the web-slinging Spider-Man, starting out as an alien parasite known as a Symbiote and bonding with Spidey during Marvel’s Secret War in 1984, before latching onto Eddie Brock. He has previously appeared in Sam Raimi’s underwhelming Spider-Man 3 (2007), played by Topher Grace, and featured as the primary antagonist in the fantastic videogame Spider-Man: Web of Shadows. The trailer does a great job of teasing the movie without giving away much of the plot. It even includes a grizzly shot of Eddie Brock transforming into Venom, and he looks fantastic! The voice sounds great and the way the filmmakers handle his dual identity looks great, with him trying to reason with the voice in his head, saying it can stay only if it hurts bad people. Venom will mark the beginning of Sony’s planned shared universe featuring multiple villains from Spider-Man’s rogues gallery, with Silver and Black next in the pipeline. How the story will develop Venom without the wall-crawler remains to be seen, since both his look and his powers are due to the suit’s time with Spidey, however it looks like they may have a good substitute. Zombieland’s Ruben Fleischer is on directing duties, while the script was crafted by Kelly Marcel and Will Beall. Venom will be released on 5th October 2018.